However, I did manage to get an all-up dry fit assembly, so I was able to get the holes and slots cut for the mattress platform’s rear support, so that’s done at least. I did discover that the mattress support platform didn’t want to fit; I knew there was some interference with the rear upright, but I thought it was 1-2mm and a few swipes of a plane would fix it. Well, that’s disappointing. But at least it’ll be at the back and under a mattress and there’s still enough strength there to hold (there’s a wide support right under that when this is in use). Still not getting much love for round-bottomed spokeshaves btw, that tight radius was what I thought would be perfect for them, but nope, still no joy. 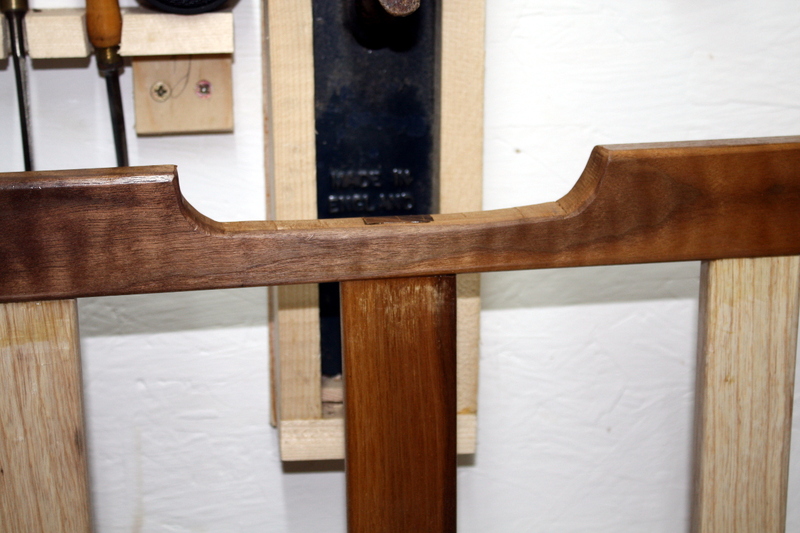 Used a rasp and chisels and sandpaper instead, then reapplied shellac (that’s coat #2). I also noticed that all my working clamps are about a centimeter too short to use for the crossrail glue-up, so I decided to go with wedged tenons there. So today was prepping for that. 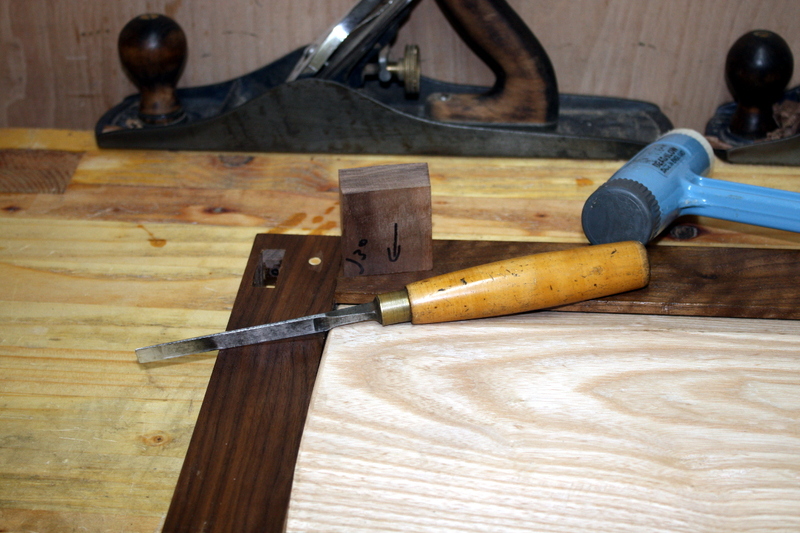 First off, a quick jig – take one piece of walnut with a square end that’s 50mm long, and plane down to a line going from the square corner to a point 2.5mm in from the adjacent corner. That gives you a 87 degree angle. 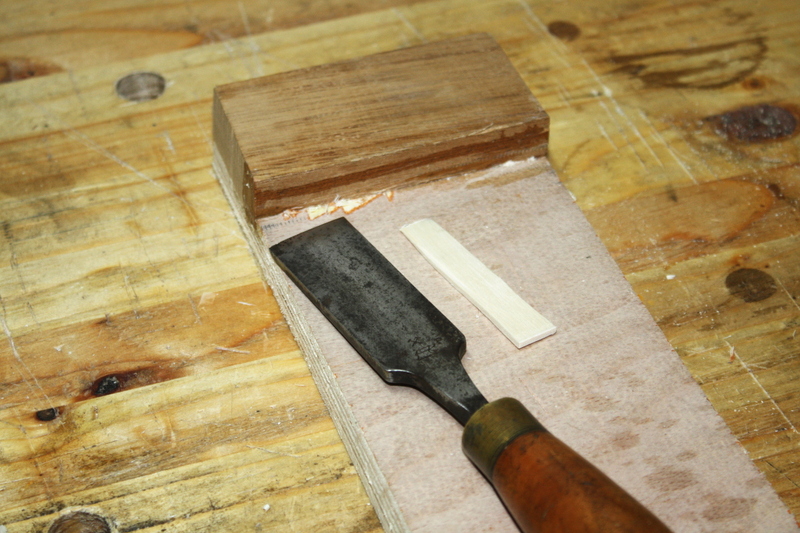 Now slide the chisel down that angled face, and that’s how far to pare the mortice walls to flare them out on the face side. 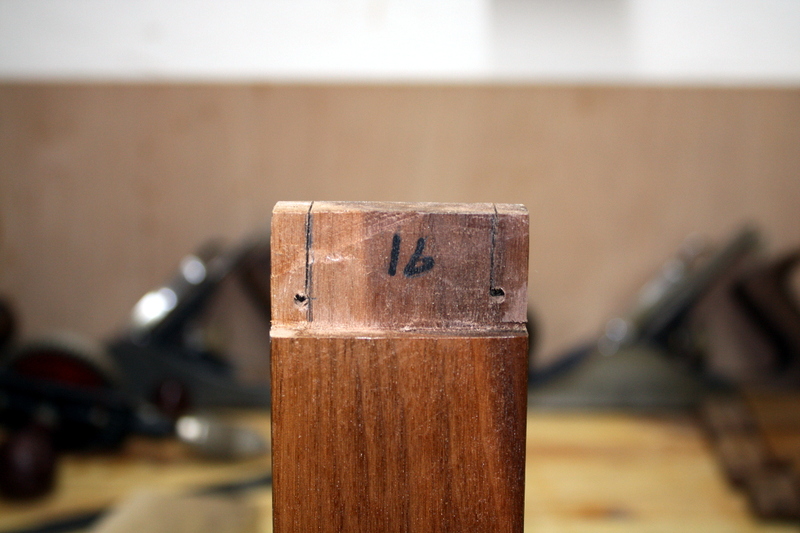 (For those who don’t know, a wedged tenon has to have room to expand as you drive in the wedges, otherwise you’d just pop the top of the mortice clean out of the wood by shearing along the grain lines). Next, make wedges. 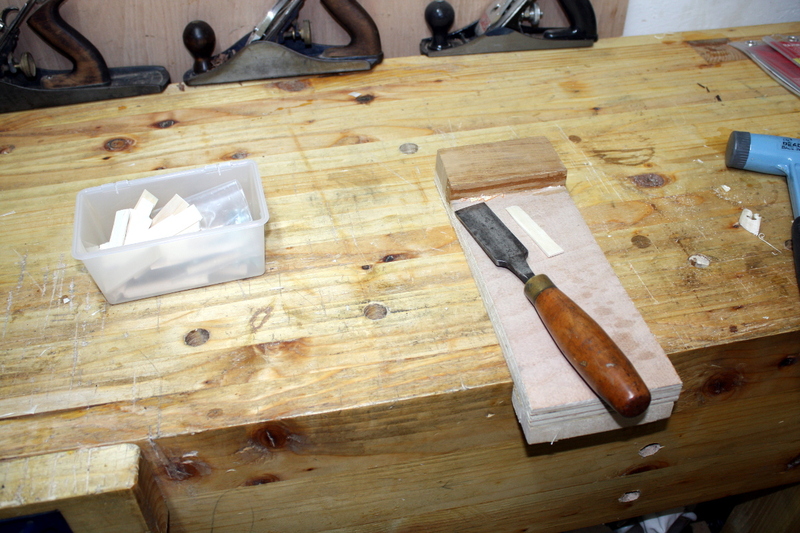 Rive out more of that lovely white sycamore stock, cut about 2-3mm thick and the width of the tenon wide, then put the end of the rived piece into the bench hook’s block and pare it to a point with a wide chisel. Do that about twenty times or so and you’ve enough wedges even allowing for breakage. Grand. Next, take a 3mm drill bit, and drill two strain relieve holes in each tenon, about 6mm in from the edge and up from the shoulder. 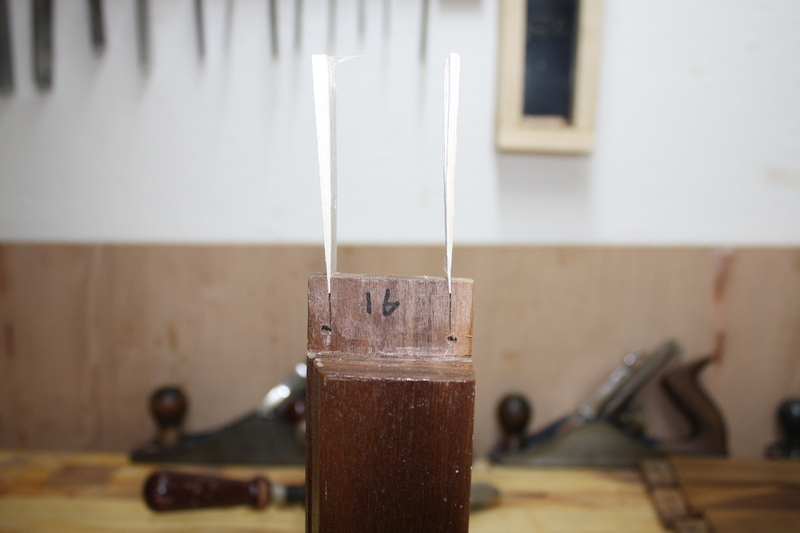 Now cut down a line from the end of the tenon to meet the inside tangent of each circle and you have a tenon with two end pieces that can flex outwards slightly. And now when you go to glue up for final assembly, put the joint together, (glued up and everything) then take two wedges, paint with a light coating of glue, and tap them just home into each cut. And now take your hammer and drive them home. They may not go down all the way, they might bottom out before that; but either way you now have a wedged tenon M&T joint that doesn’t need clamps to hold for glue-up and which has a mechanical aspect to lock the joint as well as the glue. And with the contrasting woods, they’ll be decorative as well, hopefully. 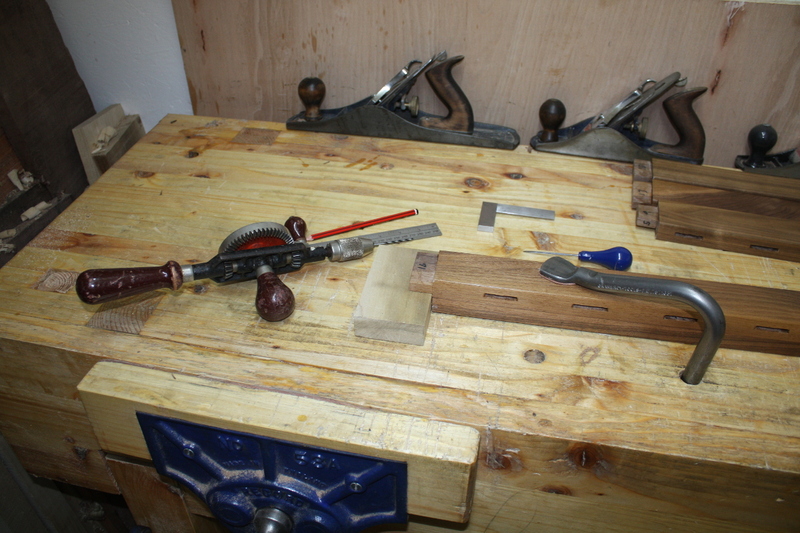 Tomorrow it’s time to sharpen the scrub plane and get that drawer side thicknessing finished so I can get on with making the drawer. 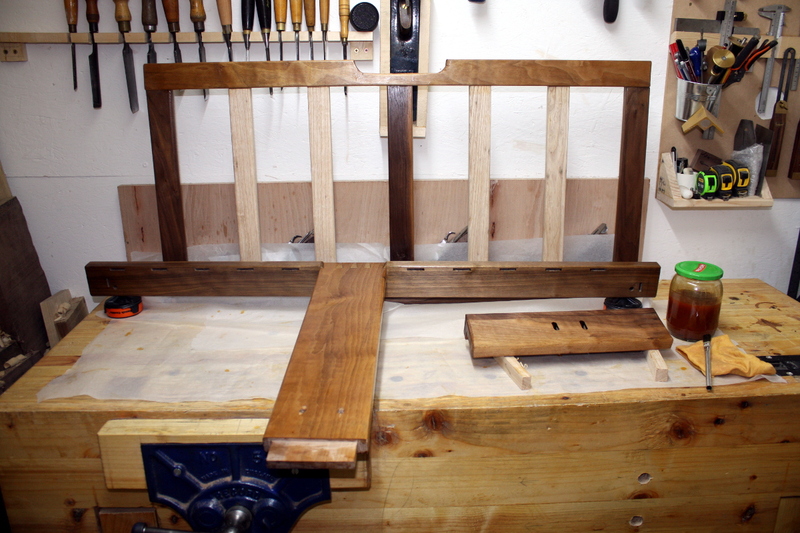 I’ll get the last coat of shellac on things as well, and that’ll let me do the final assembly of the frame as soon as I complete finish planing the top panel.